Brown Space Engineering has started to participate in the Satellite Networked Open Ground Station (SatNOGS) project. Numerous radio receivers around the world listen for transmissions from satellites and the observations are then automatically uploaded to their website. The recordings of these receptions tipped us off to a close approach with another satellite transmitting on a nearby frequency. Map showing some of the ground stations that heard a packet on 8 Nov 2018 at 06:18:40.701 UTC and the position of the satellite at the time of transmission. We scheduled observations of EQUiSat on multiple ground stations in the eastern United States during a pass a little after 1 AM local time on November 8th. The goal is to try to understand the orientation of the antenna (and also the entire spacecraft) by comparing signal strength when two or more stations hear the same packet. The simple 70 cm dipole antenna on the spacecraft is directional. The maximum signal strength is perpendicular to the wire. We might be able to infer how the antenna was oriented at that moment by looking at which stations missed hearing the packet or received a weak signal. The line of sight from the satellite to a subset of ground stations. We’ve only looked at a handful of recordings so far but the results look interesting. 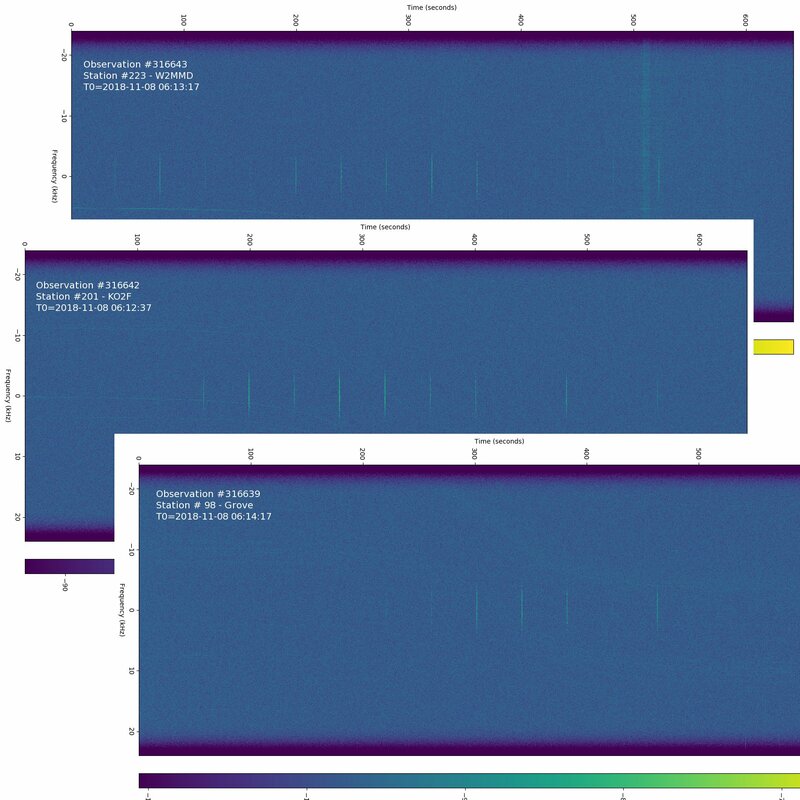 Each of the three recordings shows receptions of EQUiSat packets as thin green vertical lines. They are centered on a Doppler shift corrected frequency of 0 kHz. The plots are offset so that a single packet received by multiple stations are aligned. Waterfall plots showing frequency versus time. Credit: W2MMD, KO2F, and Grove SatNOGS station operators. The packet received at the Grove station at T0+300 seconds corresponds to the same one received at our Ladd Observatory station. All four stations had a good reception of this packet. This likely indicates good satellite antenna alignment with all the ground antennas at that particular moment.The next packet heard by Grove at +340 seconds was the only reception by any of the four stations. We’re not sure why Ladd didn’t hear that one. A more complete view of potential station receptionss during the pass. The circles shows elevation in degrees above the horizon. We haven’t yet examined all of the receptions. The other packets have signal strength that varies. This is in part due to the changing elevation angle and distance. We’ll need to look at a larger number of receptions before we can draw any conclusions about antenna orientation.